Plus some other goodies that didn't fit into the title! Such as...goat cheese, fresh mozzarella cheese and sun-dried tomatoes (if you dare)...mmm. I threw this together Sunday night after John and I had a great date day. I knew we wouldn't need too big of a dinner - late lunch at Yats will do that to you. I checked out the ingredients I had in my fridge and pantry, and decided I would do something a little different. My good friend Jourdan seems to make amazing Mexican dishes all-the-time, and when she posted this I was inspired to do something myself. John absolutely loved these! He told me to "add them to the list" and said he loved all the different flavors. I was a huge fan as well. There were so many great flavors in these, plus it was a snap to put together. Who doesn't love fast, easy meals? Besides, this is crammed with whole grain, protein, veggies and...cheese! How can you go wrong if cheese is in it? *Melt 1 tsp. butter in small saucepan. Add onions and brown sugar, and cook on medium to medium-high heat until caramelized. *Spread half of goat cheese on one side of a tortilla. Melt 1 tsp butter in medium saucepan and place tortilla in the saucepan. 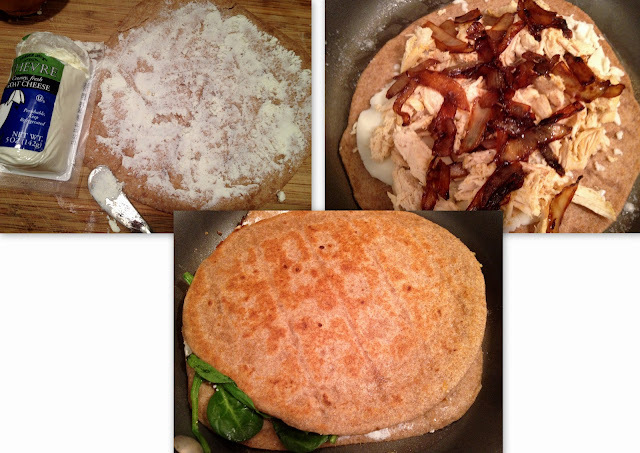 Add half of: mozzarella, chicken, caramelized onion, sun-dried tomatoes and spinach. Top with goat cheese tortilla. *Cook until golden and crisp, then flip quesadilla until other side is golden and crisp. Remove from skillet. *Repeat with remaining ingredients for second quesadilla. *Cut into fourths and serve immediately! Thanks so much! I will continue to do just that. :) Thanks for reading!